This upcoming series has been a long time in the making and I am so excited to finally share it with you! The TR barn I work for has us make goals every year, and 2 years ago one of my goals was to learn more about teaching riders with Autism. I finally compiled all the information I gathered over those past 2 years into the following series, “Teaching Tips for Riders with Autism.” Please include any information you have to add in the comments! The book Autism: Explaining the Enigma – explains the history, theories, and scientific studies of Autism. Very interesting and easy to read! 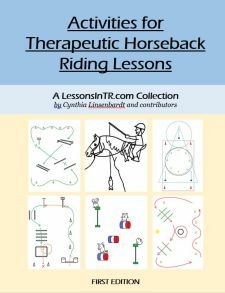 What I am going to tell you are some concepts that have helped me understand my riders with Autism a lot better! There is a lot of research on autism happening and new things are being learned every day, so I’m NOT saying this is the hard proven truth, but these concepts have helped make sense out of things for me. I hope it helps you! Current theories, books, and seminars I’ve attended. Individuals with autism have neurological issues with sensory integration and information processing. Often they can only process one sense at a time. So they focus on only hearing, seeing, touching, smelling, or tasting. Add more than one sensory input and their brain cannot effectively process everything. Knowing how their brain processes sensory information helps us understand and communicate with individuals with Autism. Current methods tend to focus on fixing emotional skills first, because that is the biggest behavior problem we see. However, we need to fix the sensory overload FIRST because this is the root of emotional/behavior problems. Fix the sensory issues and the rest will improve – at least as much as it can for that individual. Many individuals with mild Autism (previously called Aspergers) just need someone to teach them a better way. For more information watch the “Sensory Funnel” video from Asperger Experts! The ability to mentalize happens around 18 months and expedites the learning of language, appropriate behavior, and everything in general. Individuals with Autism are stuck in primitive reactions of self preservation. They were unable to deal with the shock of birth. how their or their body is now separate from their mother’s. Riding takes them back to a familiar place as before the shock of birth. Riding resembles being in the womb: the pace like the mother walking, the rhythm like the mother’s heartbeat, the horse makes no demands, the child is attached to a large warm being. This security allows them to restart the process of accepting sensations and integrating them into their person. The child is thrown into a relationship with the pony because he is in contact with the pony. First he bonds with the pony. Because the instructor is also in contact with the pony, by extension the child comes into relationship with the instructor. He extends the bond with the pony to include the instructor and mother. Claudine incorporate the mother into the lessons to allow this. That’s all for today! Coming up next: Preparing (for teaching your rider). What other concepts have helped you? Please leave a comment! Thank you for a very well summarized post. It was good to see many of the points put into a succinct article. I look forward to reading your future posts. Agian and always thanks. your willingness to share what you have researched is invaluable. Looking forward to more posts. I have a son who is on the spectrum and also has learning disabilities. He is high functioning. He has been riding independently for over a year now. I can honestly say that his self-esteem has greatly improved. His focus is better when riding. His social skills are improving also. That is so great to hear, I’m so glad riding has been beneficial for him! 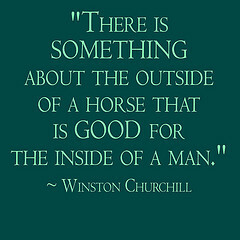 It’s always encouraging to hear client stories, since we instructors only see what happens in the arena. Thank you for sharing.